ProPhotoForums.com :: View topic - A little anxious, and just want to get my feet wet. A little anxious, and just want to get my feet wet. Posted: Wed Apr 05, 2006 7:30 pm Post subject: A little anxious, and just want to get my feet wet. So I am very anxious to start heading towards the professional side of photography. I would love to be an assistant, or something like that (heck even if someone threw me into a photographer, working under them, I would be really excited). I really don't know how to go about this however. What I have tried so far is just going to photographers in my area and simply bringing my portfolio and asking if they would be interested. What else am I really able to do? Thanks in advance. Where are you in New Mexico? Jim Hunter! Help this kid out, he's in NM. Anyway, it sounds like you're off to a good start letting local photographers know that you're interested in assisting. Depending on how large your market is, it may take a while to get assisting work. Since I don't know where you are yet, I'll leave it there for now. Yeah, I am right outside of Albuquerque, in the Cedar Crest area. It seems like the market is a pretty decent size here, considering the amount of photographers in the area. It seems like it is taking forever to find an assistant job, I guess when it comes to photography I get a little excited though. Getting in to meet them is the best way. Some photographers like to see a resume, but I don't care about that so much, especially for new assistants. Many of the assistants that I know contact me at about once a month with an email, promo card in the mail or phone call. It's all about being in the right place at the right time. It might be helpful to go down to the local rental shop, if there is one, and let them know you want to assist too. If they have a bulletin board, print out a card and stick it there, along with the local labs. It also helps to know how to use all of the major strobe equipment and cameras. Ask the folks at the rental place how best to go about that. They may show you how to work some of the stuff when they're slow. Albuquerque may seem like a decent sized market but it is not nearly as big as one would think. Part of the problem is that New Mexico has more photographers per capita than any other state. I know quite a few photographers in the area so if you would like to contact me off list with your particulars I'll pass it around. by Matt Proulx. 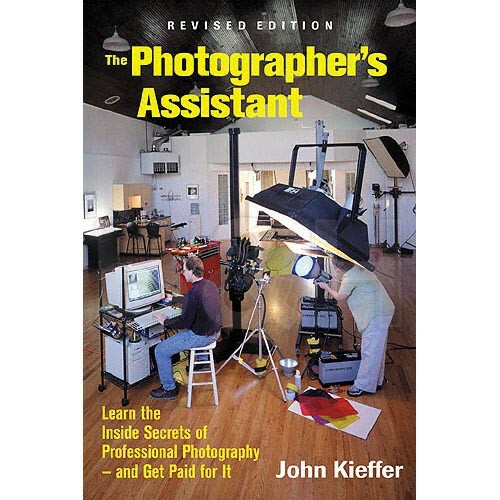 I haven't read it but from what I have heard from others it is full of good information for anyone wanting to become a photographer's assistant. Thank you for all of your help, and information. This truely helps me a great deal. You said that you really don't like to see resume's all that much. Why is that Brooks? Do you mostly judge off of personality, or just actual exprience in front of you, instead of on paper? Once again, this is a big help!!! Assisting is the best way I know to determine what it is that you want to pursue in your own photography. I can appreciate your being excited as you embark on your photographic journey. It's awesome as you realize the opportunities that are possible. Heck, I was so excited that I never finished school! NEVER FORGET THIS FEELING! Keep shooting for fun so that you will to hang on to this feeling, even when you are overwhelmed with too many things to do, or in slow periods in your assisting work. The best way to get assisting gigs is to get in front of the photographer, like you have mentioned. Sometimes, however, it is difficult to get that initial meeting, since photo shoots and studio schedules are so hectic and constantly changing due to a clients needs. One way to get your foot in the door is to make a phone call, or even better, send an email. It is best to make the first contact on the photographers terms, and a simple email allows you to introduce yourself to the photographer in a way that gives the photographer the ability to get to know a little about you when they have the time to read your email. Let them know why you admire their work, write a mini resume or biography of some of your experience, maybe include a couple small jpg�s from your portfolio. If they use freelancers, you will usually get a response. If, after a few weeks you haven�t received a response, it is easy enough to send them another quick email, or follow up with a phone call. Another method is to post a flyer or business cards at professional photo labs and equipment rental stores. This has become less effective in recent years, however, as many film shooters have converted to digital and don�t frequent the film lab too much anymore. But, don�t let that stop you... rental stores are still very busy these days. I have also scored gigs from posting a profile resume on other photo websites that cater to our industry. Just being visible in forums has landed me work! There is really no right or wrong way to go about this, but I have found these sources to be the most cost effective and results oriented. Just be persistent, honest, and creative... be yourself. Let the photographer know that you are available for them. And, don�t give up. Once you have one or two photographers to list as references, then a resume would be good. The only part of it that interest me though is who you've assisted, what equipment you're familiar with and any other skills you might have like carpentry, or electrical, or spoken languages, etc. I don't care if you went to photography school, or school at all, as long as you sound like you are smart enough to pull off a decent phone conversation. Thanks a lot Tim, that was very inspiring, and I will take your advise to heart. Brooks, I can see where you are coming from with the supermarket job resume. I never have shown them a resume, just brought along my portfolio. Do you like to see portfolios at all? Or would you just rather have conversations? And I can't thank you guys enough!! Yeah that makes complete sense. So you were an assistant for five years? Is that how you got started in your photography career? Was it your best choice, or would you of done differently? Yes, I am a very curious guy, whom asks more questions then you can shake a stick at. On a side note I checked out Terry Sutherland and wow, I really love his style. One of the photographers told a story how when he was pre-occupied his assistant actually told the client that he can do the same thing cheaper. Awesome, I'll be over at the book store tomorrow to check out these books. And wow!!! I can't believe the backstabbers that call thierselves assistants. Crazy!! The only thing I would have done different is get started younger. I had the opportunity to start assisting before I even knew that it was what I wanted to do and passed it up. I kicked myself for a long time over that. You guys brought my spirits SUPER high. Thanks for everything again!!!! Thanks for all the links, advise, stories, and positive attitudes!!! Posted: Mon Mar 12, 2007 11:39 pm Post subject: Do You Dream Of Becoming A Professional Photographer? I Did. I have an inspiring story to tell that should give you hope. Just a few short years ago I dreamed of being a professional photographer and I can tell you with a little hard work and focus you to can do what I have done. My goal is to inspire others to go for their dream as well. I started assisting at a large catalog house in Miami, then jumped to NYC, catalog houses are great places to learn the basics and get some experience under your belt as most of this places work like a photo factory and you are in the process of shooting from morning 'till quitting time every day but you can burn out in those places, don't make acareer out of this unless you wantot be a catalog house photographer and there is nothing wrong with that. It helps a whole lot if you can figure out what type of photography you are interested in so down the line you make an effort to assist the guys that shoot that stuff. In my days it was a rite of passage for anyone serious in photography to go to New York to assist, I suppose that still works but these days with globalization it might not be a requirement.